A standing seam roof is among the most durable and maintenance-free type of any metal roof and can last over 30 years. Standing seam roofing provides additional energy reduction benefits and can be installed easily, in many instances over the existing roofing material. The Standing Seam roofing panels can be designed with various radius roof profiles making it ideal for structures with several roof levels. 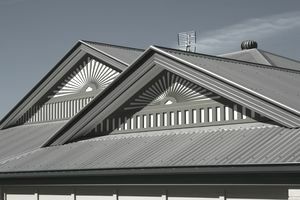 This type of metal roofing is made up of vertical panels with two seams per panel that stand us vertically. Once installed, its dramatic shadow lines run continuously from ridge to eave, accenting the pitch and plane of every roof angle. Standing seam metal roof is formed or installed by crimping each adjacent seam together sealing into one join. One of the main advantages or purposes​ is roof drain. Standing seam panels must be installed in sequence but after the recommended underlayment has been placed. The underlayment is very important so be sure to choose the right one and I recommended using a self-adhering ice and water-shielded product. Standing seam panels are usually about 18 to 24 inches wide when finished running parallel to the slope of the roof. The panels are attached to the underlayment by using clips or fasteners allowing the metal to expand or contract as temperature changes. Using a crimping tool, crimp together both seams and keep repeating the crimping action until all panels are seamed. Standing seam metal roofs could be the best choice for your roof even over the existing roofing material. They will last a long time and could even last more than 2 times the life of roofing shingles. Metal roofs and standing seam roofs are manufactured out of steel, aluminum, and copper so you will have multiple alternatives to choose from. Metal roofs required no or very little maintenance over the years and they could even withstand winds up to 140 miles per hour when installed correctly. They also offer fire resistant properties and will not collapse due to heavy water or snow loads, however, be careful to use the right gauge to prevent damage from hail. Metal roofs are manufactured in basically all colors and finishes, matching your architectural needs. The metal reflects the sun’s rays, which in turn reduces heat transfer to the house. In many cases, standing seam metal roofing will lower your cooling costs by up to 30%. Standing seam metal roofs are an excellent alternative that can be used in your project, however, be aware that it might have some disadvantages too. Shingles could be a less costly solution, although high oil prices are making shingles a little pricey these days, bringing them really close to standing seam prices. One important aspect to consider is that this might not be the best idea or roofing solution when the roof is too steep. Walking on metal roofs can be really dangerous and extreme safety measures shall be taken. Metal roofs are really difficult to install on roofs with lots of equipment, vents, chimneys, and skylights. Standing seam cost will require an onsite inspection to determine the installation feasibility and other related information. Normally, a complex installation will cost an additional 10 percent in material and labor costs. When quoting a metal roof be sure to include delivery, underlayment, counter flashing, soffit and vents, stack covers and fasteners. For example, standing seam 29 gauge 12” will have an approximate cost of $2.45 per linear foot while the 29 gauge 16 panel is near $2.75 per linear foot. However, these costs are approximate and might represent the actual costs of standing seam panels.